I've started a new weekly ritual of treating myself to a small bouquet from my local fancy (i.e. expensive) florist. I give myself a $15 limit and then select an assortment of complementary stems. I adore the owner: she is so supportive of my interest in arranging and allows me into the back of the store to analyze different varieties with her and offer suggestions before wrapping up my selections in a single sheet of waxy kraft paper. I'm generally attracted to looser, more wild arrangements and try to take my time when choosing stems. Usually I base it on the feeling and colors of the flowers, but I'm easily swayed by scent, too. 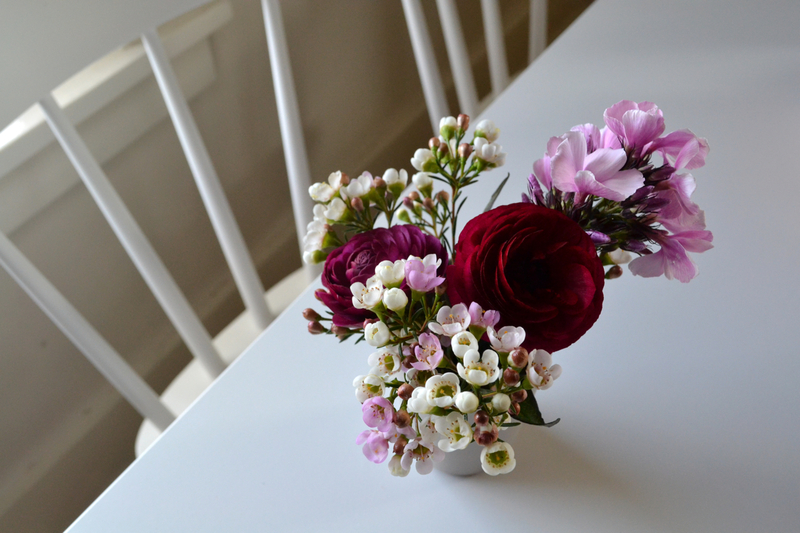 This week, I chose waxflower, ranunculus and a single stem of phlox. 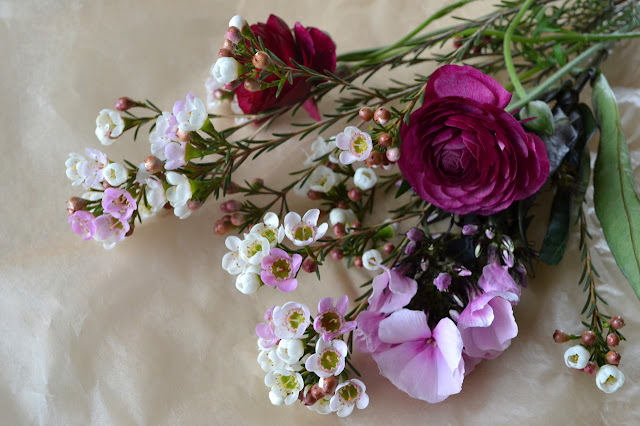 I was enthralled by the rich plum and cranberry tones of the ranunculus mixed together with the lighter shades of violet and pink. An end-of-winter bundle of jewels. P.S. Here is a helpful online guide to buying seasonally. P.P.S. 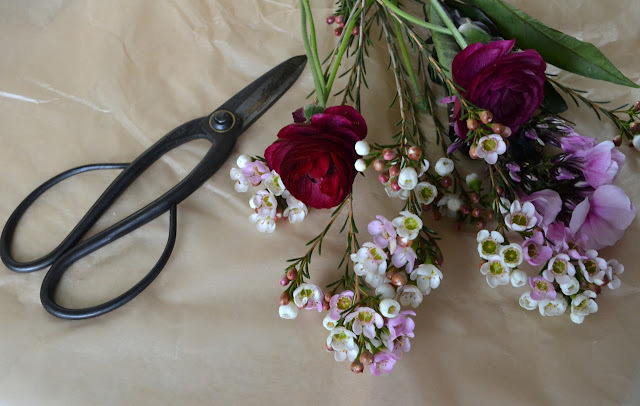 How viable is the pipe dream of owning my own tiny floral studio someday? Kayla, I often think about taking some classes in floral design. I haven't done so yet , but there is still time. You have inspired me to look into it in earnest. Thank you. 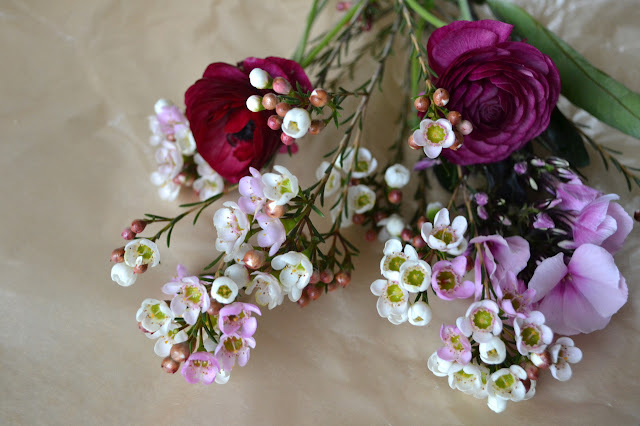 On March 11th at Experience in Schenectady, David Siders is conducting a demonstration called " Arranging Supermarket Flowers". I think I will start there. What a lovely thing to do to treat yourself. You know what, I might just start doing this as well. I love my trips to Columbia Rd Flower Market but I need to make them more frequent! Can you open your sweet little shop next to my bakery? Then we could have lunch together every day. You did a beautiful job, Kayla. I've always had fun putting little bouquets together, but I oddly don't have a flower source close to my new home. 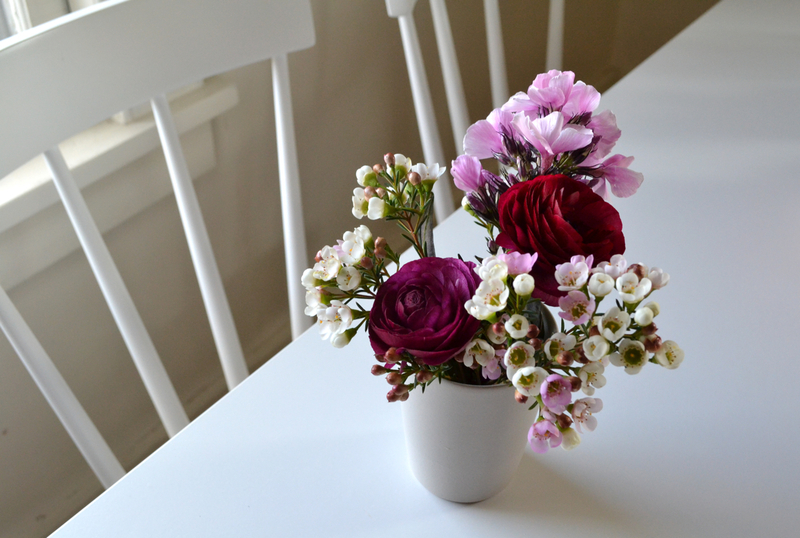 fact: ranunculus make me weak in the knees. very very cute... great colors!